Lathan Goumas - lgoumas@shawmedia.com Trevor Frey, 7, of Lake in the Hills sits to meet Alshon Jeffery while the Chicago Bears wide receiver signs autographs for fans at a Verizon store in Lake in the Hills, Ill. on Tuesday, Nov. 26, 2013. Lathan Goumas - lgoumas@shawmedia.com Ravi Patel, 7, and Shivh Patel, 10, compare the autographs from Chicago Bears wide receiver Alshon Jeffery after meeting the football player during a signing at a Verizon store in Lake in the Hills, Ill. on Tuesday, Nov. 26, 2013. 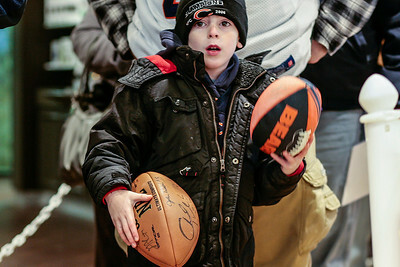 Trevor Frey, 7, of Lake in the Hills sits to meet Alshon Jeffery while the Chicago Bears wide receiver signs autographs for fans at a Verizon store in Lake in the Hills, Ill. on Tuesday, Nov. 26, 2013.